Manuel Antonio & Quepos are located on the central Pacific coast of Costa Rica. Travelers have several options to arrive to this amazing area including short commuter flights, rental cars, bus service, private taxi, or shuttle bus transfers. Each transportation option offers up a series of advantages in terms of speed, price, and comfort, so choosing what is best for you depends a great deal on your budget and personal preferences. Please contact us for more information on booking your transportation inside Costa Rica. We would be thrilled to help you plan your trip, and booking your transportation through Vacation Villas could save you a lot of hassle and possibly some money too while you sit back, relax and enjoy your vacation experience. 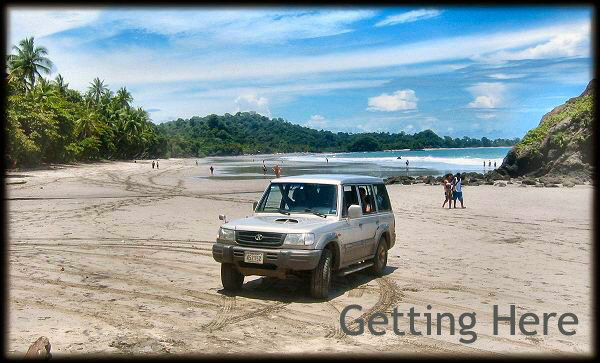 If you choose to rent a car and drive yourself in, here is a link to a google map with the easiest route to follow to get to Manuel Antonio/Quepos. If you are coming from another destination in Costa Rica, let us know and we will send you a customized google map with detailed driving instructions to get you here.